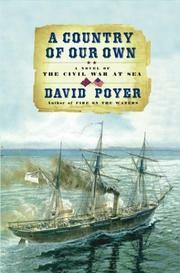 Volume two of Poyer’s ambitious trilogy about the Civil War at sea. In Fire on the Waters (2001), US Navy Lieutenant Ker Claiborne, Annapolis graduate and the very model of a career officer, faced the most painful decision of his young life—the need to make an irrevocable choice, the same one confronting other ardent Virginians—Robert E. Lee, for instance. As this sequel gets underway, it’s clear that Claiborne and Lee have cast their lots similarly: They’ve resigned their US commissions and signed on with the secessionists, Ker now a lieutenant in the infant Confederate navy. Among his fellow Southrons, however, there are those who simply don’t trust him, who see cowardice and self-seeking in a decision too long delayed. Fire-breathing Mississippian, Henry Minter—like Ker, an Annapolis graduate and CSA naval lieutenant—challenges Ker to a duel, interdicted at the climactic moment by navy brass (good men are nonexpendable). Soon thereafter, Ker finds himself reporting for duty as first officer aboard the CSS Montgomery, an old paddle-wheeler skippered by longtime friend Captain Parker Trezivant. Their charge: to undertake a watery version of Sherman’s march: that is, to torch as much of the North’s maritime trade as possible, and, by burning ships and destroying cargo, make the war increasingly unattractive to Yankee business interests. Ker, an apt pupil, learns from Captain Trezivant and later succeeds him when the latter’s luck runs out. As a marauder, Ker performs brilliantly, even infamously, infuriating the enemy and earning the accolade of having a price put on his head. But his domestic life is complex. There are a son and a wife home in Richmond, terribly missed. And there’s also a shipmate, a fierce and intransigent warrior woman, whom he’s unwillingly drawn to. Will receive—and deserves—a warm welcome from the C.S. Forester/Patrick O’Brian audience.